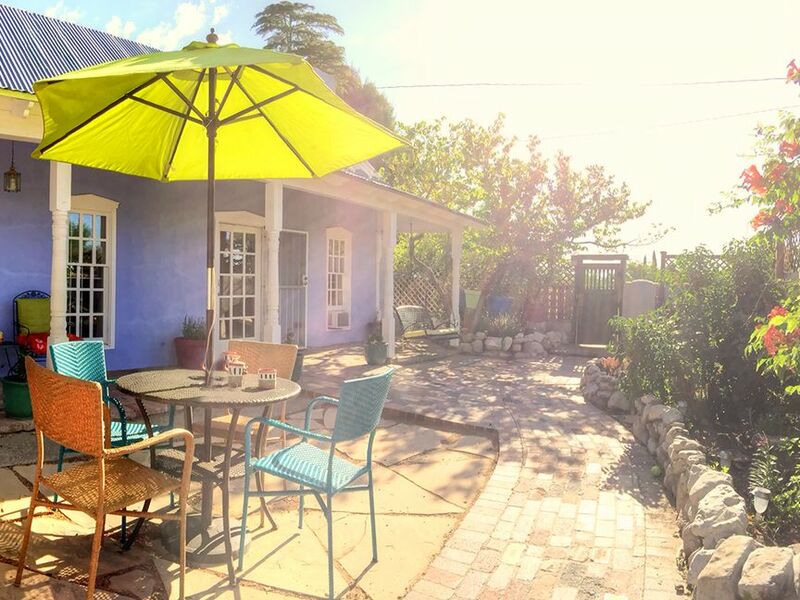 Casa Azul...Spend Your Vacation in Truly only Casita steps from Historic Old Town Plaza. Exquisitely appointed Northern New Mexico style Casita located in the heart of Old Town just steps away from the historic plaza. “CASA AZUL” is the perfect get away with over the top ammenities. An inviting private courtyard with mature trees and gardens awaits you. The spacious great room is graced with an inviting adobe fireplace, red brick flooring and a wood beamed ceiling. The kitchen decor features granite counter tops, authentic retro appliances, a washer/dryer unit and handcrafted Route 66 dining table. The bedroom suite includes a premium mattress draped with plush down comforter, custom duvet and cotton-rich linens. The bathroom is decorated in a warm pumpkin spice and accented with traditional Mexican tiles. It contains a full-sized tub and vanity. All rooms are tastefully decorated with contemporary southwest furnishings, art and accessories made by New Mexico artisans. Location: Albuquerque, New Mexico, USA (10 minutes from airport and within Old Town Historic Plaza and close to many attractions. Albuquerque and Natural History Museums with 1 block. Albuquerque Aquarium and Botanical Gardens less than 1 mile. Indian Pueblo Cultural Center 2 miles. Albuquerque Downtown and Convention Center 2 miles. Rio Grande Zoo 2 miles. Detergent, fabric softener and spot treatment provided. Direct TV w/premium channels includ. XM satellite radio. Perfect for the honeymoon getaway, family friendly within walking distance of explora childrens museum, dynamax & natural history museum. Directly adjacent to family parks including 2 for our four legged friends. Please ask for further information, we'll be happy to share. Near dowtown bus or trolley info availible. rail runner to Santa fe availible In december. We just loved our stay at Casa Azul. The location is just amazing. It has two private gates; one of which opens on to Old Town square. While its located in the heart of old town, it provides complete privacy via walled courtyard and nice landscaping. The interior is tastefully appointed in southwest motif. No detail was left out; memory foam mattress with the softest sheets imaginable and down pillows made for a restful night. Even a well stocked sewing kit was available. The living and dining room are furnished with nice pieces in great condition. Beautiful fireplace makes the living room an inviting gathering space. Snacks and pinon coffee were waiting in the kitchen. Beware, the pinion coffee is habit forming. We had to bring some home! The owner obviously love this little property and it really shows. As frequent travelers to ABQ we often stay at area hotels. No more! This is our new go to destination! We loved our stay. So close to everything we wanted to see and do. Very clean and the courtyard was a great bonus! Thank you so much for the wonderful review. I loved the great communication we had while you stayed. I hope all your VRBO experiences are as great as the one you had with us at Casa Azul. Very nice place. Nicely equipped and decorated. Really good location. Owner responded quickly to questions. Amazing Casa in New Mexico! This trip was our first adventure in New Mexico. We booked Casa Azul because it had a wonderful location near Old Town, its shops and restaurants and looked amazing in the photos! The property exceeded our expectations and was a cozy home throughout our stay. We didn't have an opportunity to use the outdoor area much because it was so cold, but I can only imagine how great it is when it's warmer! Denise was great...checked in right away when we arrived to make sure all was OK. We would certainly rent this property again. It's private, quite and comfortable. Denise...this house is amazing! It was as if we had found a hidden treasure in downtown Albuquerque Old Town. The house was perfect and we spent the Christmas holiday sitting by the fire drinking red wine and enjoying the season. The walk to Old Town for Christmas Eve was perfect and not having to deal with the traffic and return to the house for a wonderful evening. We look forward to our next visit. Lovely little casita in the perfect setting. Even though you are literally a stones throw from the Plaza you are still in your own private little world. Casa Azul is cozy and wonderfully appointed. My husband, 2 furbabies and I spent Thanksgiving there and I wanted for nothing in the kitchen. All I brought was the food, and yes, I did a turkey with all the trimmings. (she even has a potato masher). High quality linens? Great water pressure with lots of hot water? Directv and great WiFi? Yes, yes, yes and yes! I feel I should also mention that it was spotless. Not a dust bunny or cobweb anywhere. I almost forgot it also comes with parking, a HUGE plus in Old Town. We loved everything about our stay and are looking forward to our next visit. Dearest Jen, thank you so much for the incredible compliments. Your review beautifully states everything I aim for at Casa Azul. I’m so happy you and your four legged family members enjoyed our home. I definitely look forward to having you stay again as it will be just as you found it this past stay. Be well and see you again soon.